On Sep. 26, 2016, the Gresham-Kite Pilot Scholarship House in North Lake Village opened its doors to welcome Eagles in hopes that students become aware of the rent-free living opportunity. The Welcome Center team and students were invited to tour the house and experience the atmosphere. This was done in order to showcase the scholarship house and its purpose of helping Eagles reach their potential by relieving the stress of housing costs. Ambassador Tatiana Castro said the main focus is making the Scholarship House well-known and connected with the community. The Scholarship House is an opportunity that exists for only female Eagles to live in the facility free of rent. The applicants must apply online through the Southern Scholarship Foundation website, have a 3.0 GPA, strong character and the financial need. The Scholarship House has a limit of 17 girls. “If you really want it and need it, go online and apply,” Castro said. Students that qualify for the scholarship on average pay about $900 per semester to cover food expenses and service fees for the utilities of the house. Students who qualify can stay there throughout their college journey, providing housing stability. Together, the 17 girls share responsibilities to empower the house as a team. Responsibilities vary from sharing cleaning details to being paired to join the cook crew. Students living in the scholarship house recognize how helpful it is in their experience as university students. “I live in a house with 16 other motivated girls, so it keeps me motivated. It works. We are a family,” Stephenson said. Her focus like Castro’s is letting others in the FGCU community become aware of this housing scholarship opportunity. Other students like Sharena Jean-Baptiste said they were glad the opportunity is present. She is a graduate student here at FGCU, and stated how it was difficult for her to leave her sister back home, since they had studied together at her previous university. The atmosphere in the house was full of welcoming faces and smiles. Students present said they had never explored the scholarship house. 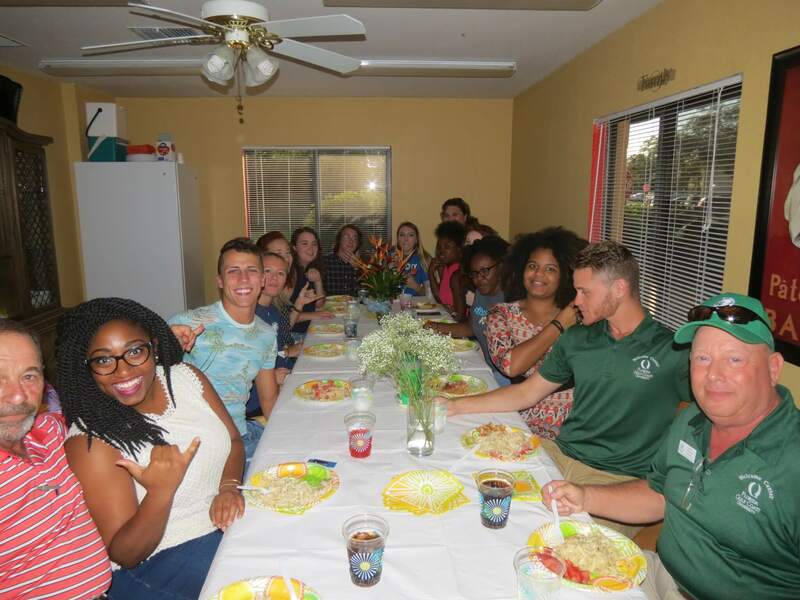 Tami Tassler, Associate Director of Admissions Marketing and Communication and Welcome Center Manager, expressed how the scholarship house reminded her of when she was in college and how it was a wonderful opportunity at FGCU. With a full house, the girls gave a tour of their nest and provided a meal, cooked by the girls. Positive vibes were in the atmosphere, with hopes of letting students know this could be their home as well. The scholarship house is building its own reputation, making it clear that it is not just another housing building in North Lake, but an opportunity for the community.